We are currently writing to you from Durham, England, where the weather is not ideal (aka it is super windy and chilly). However, after two LONG days of traveling we finally made it to Scotland. Even though we had minimal sleep, our voyage was unforgettable! Our flight to Newark began with the sassiest and meanest flight attendant “greeting” us. After yelling at Charlie for not listening and talking back to Kendall when she tried to stand up for us pilgrims, the flight attendant ended up telling Charlie a tragic story about how a man tripped on his backpack, cracked his head open, and died on that very plane a few weeks back… very pleasant. We soon arrived at the Newark airport to stay there for about 7 hours. Personally, we now KNOW that Newark is truly the armpit of New Jersey. Newark had very few dining options, some of which were organic and wouldn’t take cash. The pilgrims spent most of their time playing chess (thanks to Claire’s mini chess set that is adorable and tiny) and cards. Henry and Matthew endured a 2 hour long chess match, which resulted in Matthew winning. Much to our relief, the layover ended and we began to board the plane to Edinburgh. The flight to Edinburgh was alright. Most of us didn’t get much sleep at all; some of us even felt extremely sick and ALMOST threw up! Luckily, we pilgrims pushed through and landed safely on the ground in Scotland. Walking around in the Edinburgh airport, we got our first tastes of Scottish accents (which rock even though you can’t understand them half the time). We then boarded our stylish and sassy bus with a bright red velour interior! Our first destination was Melrose Abbey, which took about an hour drive from the airport. We were all amazed with the simple and ancient beauty of the abbey. 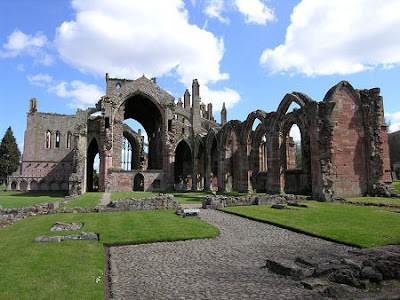 We got to walk around Melrose Abbey, listening to our handheld headsets. We all stopped in the cloister, a place where monks used to gather and pray, and just laid down on the grass (mostly because we were tired, but we were also reflecting in our journals on what we had just seen). After that, we went to lunch in Melrose. We then went back to the cloister to do our first Lectio Divina and reflect on that. Then, we got back into the bus for another hour long drive to out next destination, Hadrian’s Wall. Before we got to Hadrian’s wall, we stopped at the border of Scotland and England to literally walk across the border and take pictures. At Hadrian’s Wall we walked around looking at old Roman structures (our favorite structure was the Roman bath, mainly the frigidarium). We continued to explore and obsess over the lambs and the luscious fields. Today’s journey ended with us arriving at our hotel and FINALLY taking showers!!! We ate some good din din! Sorry, but we started our day yesterday at 6:00 AM and we are all a bit tireeeeeeeeeeeddadacm cv ……….